So how do you draw cars that look awesome? 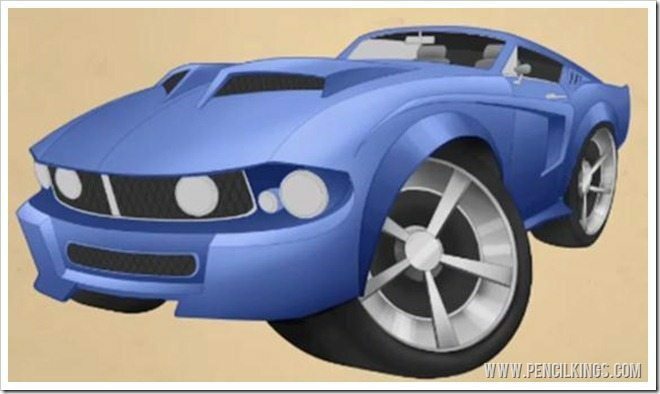 In our previous lesson, you saw how our tutor, April Eriksson, used a variety of techniques such as masking and brushwork to render her 1967 Mustang in grayscale before adding new color layers. Now, you’re going to go through the process in detail, picking up professional Photoshop techniques along the way. The skills you pick up here are ones you’ll be able to use whatever the subject matter, so pick up those graphics tablets and let’s get into gear for detailed color rendering! Reduce the opacity of your lineart layer – if you’re wondering how to you draw cars, this will make it easier to add the rendering. Once you’re happy with the grayscale rendering, it’s time to apply some color! You can do this by creating a new layer above the grayscale layer, selecting a color such as blue and then changing the mode of this new layer to Color or Multiply. Because these are both color blending modes, they’ll blend your blue color with the grayscale rendering underneath to create an awesome effect. To create a color she’s happy with, April actually uses two new color layers – each one a different shade of blue and set to Color and Multiply. Feel free to adjust the opacity of these new layers until you find the effect you want. 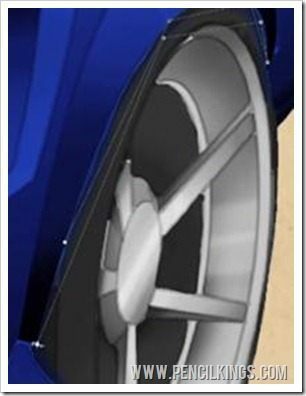 You’ll also notice that the wheels have been buffed up so they really pop. So, if you’ve ever found yourself asking “How do you draw cars that look amazing?”, you can create this effect using a series of gradients in different shades and straight lines of highlights to look like chrome. The front wheel is one the main focal points in your painting, so devoting a little more time to this now will make all the difference to your finished piece. Looking at your reference photos, you’ll notice how the bodywork of each car has got a real sheen. This is something you also want to create in your finished piece, so to do this, go through your painting and use the Lasso and Magic Wand Tools to select and mask off areas to make darker and lighter. In doing this, you’ll be adding areas of high contrast and creating the sheen you can see in your reference photos. 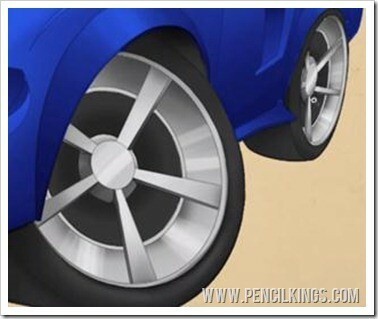 You can also use the Pen Tool to precisely mask of areas such as the wheel arch and apply a darker tone. Remember to keep switching between layers and only applying color to your color layers. When you come to paint the headlights, it’s worth looking at your reference photos again to help you out. Notice how the glass is generally a blue-green color? 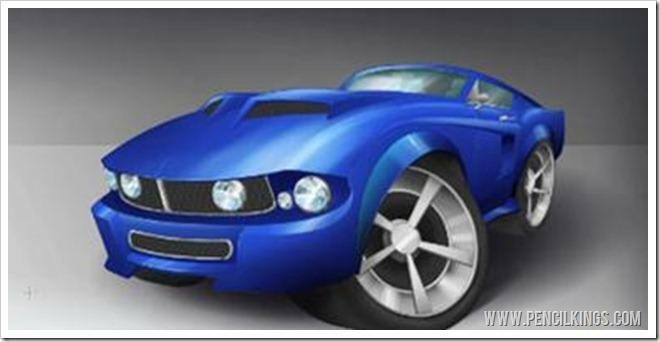 You need to recreate this is order to create realistic-looking headlights in your painting. To start off, add contrasting patches of dark and light to your headlight. Try and think about its shape and how the light bulb sits in the center of this concave bowl. Draw a series of dark wedge shapes which all converge in the center. Intersecting these is a series of white circular lines which also converge toward the center. Finish this section off with some very light areas of highlight for the light bulb itself. Once you’ve added areas of dark and light, it’s time to add some cool and warm colors too. Take a look at the headlights on a real car and you’ll notice how the top part reflects the warm color of the ground and the bottom reflects the cool blue of the sky. To create this effect, add some light blue wedge shapes in the bottom part of your headlight and some light brown wedges in the top. 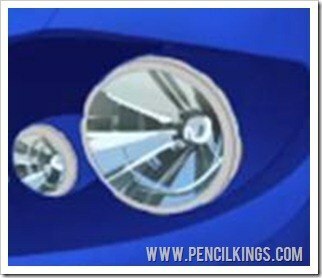 Having done that, you now need to complete your headlights by creating the glass. 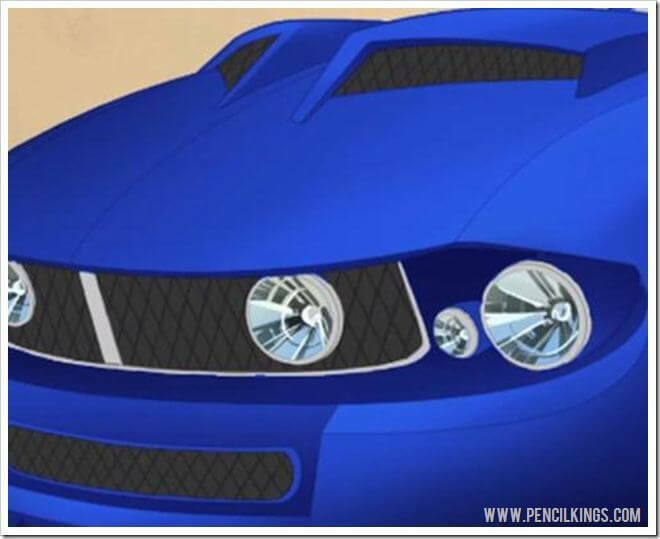 Create a new layer and select the circular shape of the headlights. Then, fill this selection in using a blue-green color as in your reference photos and adjust the opacity so it looks transparent. As a finishing touch, create another new layer and use a soft brush to create a band of reflected bright light. Your headlights are now ready to shine! We hope this lesson has taught you a lot about color rendering and how you can apply it to your own work. In the next lesson on how do you draw cars, you’ll be using similar techniques to render the wing mirror, before moving on to create realistic-looking chrome that practically glints in the sunlight! Let us know how you’re progressing by leaving us a comment in the box below.